Back in 2003 the BBC asked the award-winning scriptwriter Paul Abbott to write something 'big' for them. Abbott, who'd cut his teeth on the UK's biggest soap, Coronation Street, before creating his own shows such as Touching Evil, Clocking Off and Linda Green, was just about to become the superstar of British scriptwriting, with both his BBC project and another that was in development at the time for C4, Shameless, which was about to launch him into the stratosphere. The BBC project became the political thriller State of Play. To say the BBC pulled out the 'big guns' for it would be an understatement. Some of the UK's biggest and best actors, including John Simm and Philip Glenister (who would be reunited for the excellent Life on Mars three years later) and the mighty Bill Nighy were recruited, along with Polly Walker (Patriot Games, Rome), David Morrissey (Framed, Blackpool) and Kelly MacDonald (Trainspotting). The drama also gave huge boosts to the careers of several younger actors, most notably James McAvoy (now a big star thanks to the movies The Last King of Scotland and The Lion, the Witch and the Wardrobe) and Marc Warren (Hustle, Hogfather and a memorable cameo in what is widely regarded as the worst episode of the new Doctor Who, Love and Monsters). The series opens with a young black man being gunned down on the streets of London. Initially the murder is dismissed as a drug-related killing, although his family are adamant he didn't touch drugs. On the same day Sonia Baker, the personal assistant and clandestine lover of rising Labour MP Stephen Collins (Morrissey), falls to her death on the London Underground. Collins' breakdown makes it clear to the press and Parliament that they were lovers, and soon his career and his marriage to Anne (Walker) are in danger. Ironically, the only friend he can turn to is Cal McAffrey (Simm), the chief reporter for the London Herald, the paper which is investigating both deaths. An examination of mobile phone records suggests that the two deaths are related. The Herald puts its top journalists on the trail which uncovers evidence of high-level corruption and manipulation. When one of his police officers is killed during the investigation, DCI William Bell (Glenister) takes a personal interest in the case, eventually resulting in an uneasy truce as the police and the journalists work together to find the real story behind the deaths, whilst editor Cameron Foster (Nighy) attempts to keep his superiors from shutting the story down. State of Play is a stunning piece of work. Taking its cue as much from All the President's Men as earlier BBC political thrillers such as the House of Cards trilogy of mini-series, this is a gripping story with twists that somehow defy cliche at every turn. Misdirections crop up frequently and the extremely well-drawn characters follow through on them logically. It's nice to see a newspaper drama in which there isn't any 'lose cannon' operating on his own: the journalists act as a team, protected by their editor as long as the story seems worth it, and use contacts and modern technology to dig deeper into the facts in a very believable manner. The workings of Parliament, including how the independent committees function under pressure from lobby groups, are also laid out clearly. Acting-wise, you couldn't ask for a better cast. Nighy gives a performance that may be one of the best of his career, including easily the funniest lines of the series. It takes some damn fine actors to hold their own and stop him stealing every scene, but Simm, Glenister, MacDonald, McAvoy and the rest rise to the occasion superbly, whilst Marc Warren gives a tremendous performance as the incredibly nervous, edgy main lead on the story who is fearing for his life. Morrissey, as one of our very best but underrated actors, makes Stephen Collins a believably weak but human character. Walker is also on terrific form as the wife who finds out her husband was having an affair and planning to leave her. I don't think there's many more adulations I can pour on this mini-series, which was nominated for BAFTAs and other awards, and is now being mentioned in the same breath as Edge of Darkness among the canon of quality BBC drama serials. Filming has just been completed on an American film version, which casts Russell Crowe and Ben Affleck in Simm and Morrissey's roles (although if they do half as good a job, I will be shocked), and it will be released in early 2009. 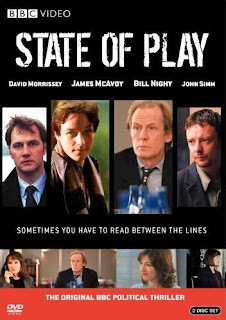 State of Play (*****) is one of the best British drama mini-series of all time, period, and I would thoroughly recommend it to everyone. It is available on DVD in the UK (for the bargain price of £8) and USA. Thanks for the review - I just checked and my local Barnes & Noble has it in stock. Now when will Life on Mars DVD be available in the U.S.?? I'm very skeptical that the U.S. production of Life on Mars will be any good. Not certain. It can take years for the Region 1 DVDs to come out for some reason. Most of my Europhile US friends have gotten a region-free DVD player to overcome the problem, to be honest. And no, the US Life on Mars looks horrendous. The problem was the script and the lead actor. I don't think setting it in LA was a problem - surely it'll be easier to make modern LA look like 1972 than NYC? 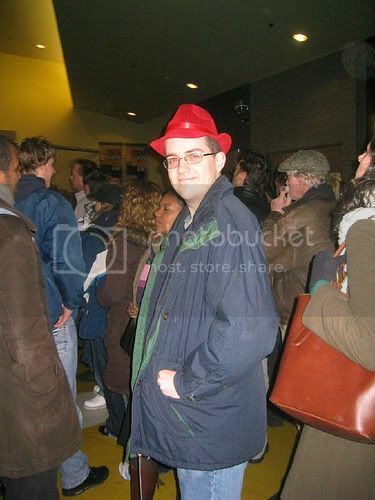 - and Colm Meaney was good, although he hadn't quite warmed to the part. Sacking Meaney and moving to NYC just seems pointless. Their lead actor is a block of wood, that's the key problem right there. Actually, I didn't have to purchase a region free player. DVD hack.com had the code to change my particular DVD player to region free, and it worked. I might consider purchasing Life on Mars from the UK.